The overall challenge for Cloud Computing is to consolidate the offering, says Alfredo Nulli, CTO at EMC. 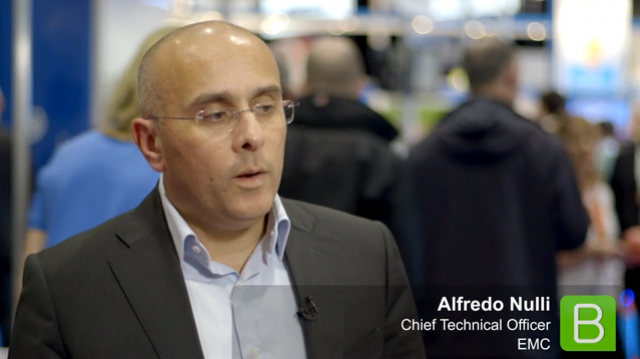 Catch up with him from Cloud Expo Europe 2014 and hear his thoughts on what challenges will face Cloud Computing and what are the key trends to take note of over the next year. More and more IT organisations are facing the challenge of undertaking data center consolidation, transformation and migration due to the pressures from the business to reduce costs and improve agility, along with enabling technologies and solutions such as virtualisation and cloud. But how do we achieve this effectively? Join Malcolm Orr for a discussion of the ideal strategies and tips, utilising the Rackspace transformation framework, to let you you easily identify the applications that can help start your business transformation and begin your journey to the Hybrid Cloud today! “Data, you’ve got to have performance to be able to mine it” says Michael Briggs, Head of Infrastructure for Cancer Research UK. In this presentation discover how one of the UK’s biggest and most important charities, suffering from serious data overload, was able to not only speed up their data access but also reduce the size of their data to be able to fully utilize the essential information within their records. Join Darren Soothill as he discusses the realities of virtualizing an infrastructure and speeding up your VDI, virtual servers, databases, analytics and every other application. As Michael Briggs said, “It’s about getting the performance into your storage to be able to leverage the data that’s sitting there. In the software-defined era, more and more functionality and intelligence related to compute, storage, network, and security is moving away from the physical layer up to the software layer. Discover how Software-Defined storage is evolving to standardize, virtualizae and automate the data center and storage infrastructure to prepare for the future of big data. Abu Dhabi's new port is state of the art and requires a state of the art infrastructure to support it. Even 1 minute of downtime can stop 2,000 cargo containers in their tracks. Implementing and creating a reliable infrastructure that protects the data, allows for essential recovery and optimizes performance for this port is paramount for its success. Discover how the port is doing this, and how this is stimulating huge manufacture business as a result, in this on-demand video. Hadoop may seem complex, but the ideas behind it are very simple. Discover a whole new way to think about big data, analytics and how you can view your information in this video presentaiton. Trends such as big data, virtualization and cloud computing may now be commonplace, but what will be their true impact as the enterprise relies more heavily on these emerging technologies? How does rapid growth in data volumes effect the performance of business applications in a virtualized, private cloud environment? • How rapidly growing data volumes in a virtualised environment can slow down application performance – and what needs to be done. • How a next-generation storage infrastructure can help deliver faster business decision-making. • Which Flash technologies are designed to speed-up access to critical data to improve employee effectiveness. • And the best practices for delivering high performance virtualised applications in a private cloud to support your business. Discover the make up of cluster architectures and the nature of enterprise storage architecture in this video presentation. Join Patricia Florissi as she simplifies cluster architectures from an engineering perspective, teaching you everything you need to know about big data storage at the enterprise level. Essential for storage veterans and novices alike. The Vatican library has over 82,000 manuscripts, many are still unread. Digitising these is essential for the Library to remain current and accessible in the modern era. Discover how this monumental storage task is being accomplished and the challenges that are faced in this on-demand video.